All day destination rides, including the Henry Ford, Motown Museum, Belle Isle and more! Detroit has momentum on its side. With growing attention and investment, it’s the right time to bring in a new crowd of adventurous ambassadors for Motor City. Motorcycle enthusiasts gather around the world in places like Daytona Beach, Myrtle Beach, Faaker See, and Barcelona for days of camaraderie, music and celebration. Now the motorcycling world is ripe for something new. Detroit is the next big draw. 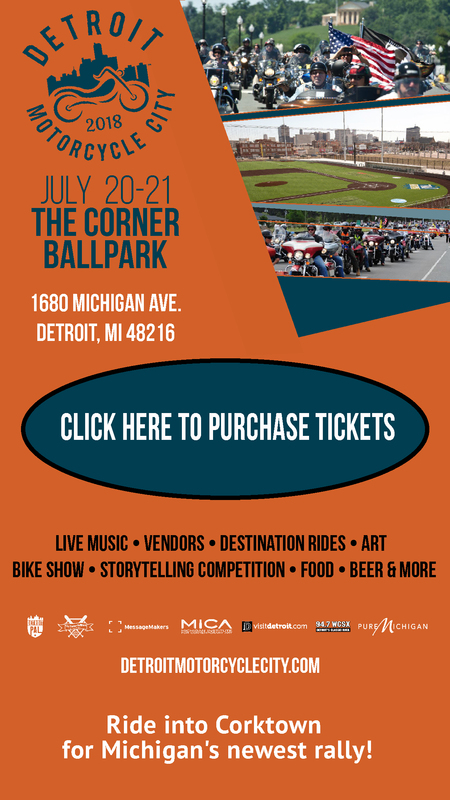 The 2018 Detroit Motorcycle City will be held at the Corner Ballpark, which is also home to Detroit PAL. In 2015, PAL launched the Kids at the Corner Campaign to raise $20 million towards the redevelopment of the site of historic Tiger Stadium. The field at the stadium is named the Willie Horton Field of Dreams presented by Meijer. This field will give the next generation a chance to play where some of the greats played! The field will host baseball, softball, T-ball, Coach pitch, football, soccer, cheer, and more throughout the year. Detroit Motorcycle City is bringing thousands of motorcycle riders together to discover Detroit area attractions, experience the city's outstanding food and museums, and enjoy group rides to destinations that truly represent "Pure Michigan." It will showcase the city’s renewed vibrancy, diverse culture and history to motorcycle enthusiasts from around the world. Questions may be directed to info@detroitmotorcyclecity.com or by calling (313) 355-2731. We’d like to thank the City of Detroit, Detroit Police Department, Detroit Metro Convention and Visitors Bureau, MEDC and other partners for their continued support and enthusiasm. Get updates from Detroit Motorcycle City.